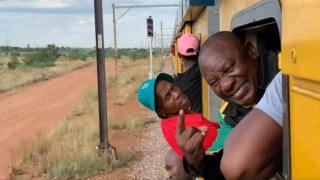 South Africa’s President Cyril Ramaphosa may have hoped that joining the morning commute would mark him out as a man of the people ahead of elections in May. That plan has either backfired or worked, depending on how you view it. He and other passengers were stuck on a train for four hours on a journey that should have taken 45 minutes. “It is unacceptable,” President Ramaphosa said after the train reached its destination. He said the national rail operator, Passenger Rail Agency of South Africa (Prasa), had to act to improve the situation “otherwise heads will roll”. Train delays are a daily frustration for millions of South Africa’s railway users and some have lost jobs because of late arrivals at work, says the BBC’s Milton Nkosi in Johannesburg. Angered commuters have even set trains alight, our reporter adds. The delay to the train the president caught in Gauteng province was caused by another train that had to stop after its driver was hit by a stone which had been thrown at him, a Prasa spokesman said. He also blamed “ongoing and sustained attack on our rail infrastructure by… thugs”.